'I just want a quiet life me, no troubles,' insists Chad Cutler, though his actions suggest otherwise. 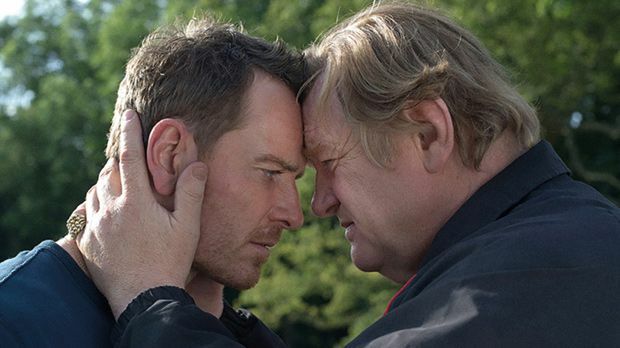 On the face of it Trespass Against Us – the feature debut of director Adam Smith – is a fairly typical tale of a man trying to acquaint himself with the straight and narrow, that falls unpromisingly into the dreaded British gangster film bracket. However, it strays from the norm in its rural Gloucestershire setting and its focus on a tight-knit traveller family. Michael Fassbender's Chad is struggling to get out of the game and looking for a better life for his son Tyson (Georgie Smith). Brendan Gleeson is suitably snivelling as Chad's father Colby, a man fierce in his ignorance and paranoia, who systematically undermines his grandson's education and keeps his own illiterate spawn on a direct path to prison. Fassbender is as magnetic as ever in the role of the cocksure criminal who gets a visible kick out of risk-taking; if his cup runneth over with charisma, he fails to convincingly project Chad's flip-side – the weak will of a man floundering under his father's thumb. Screenwriter Alastair Siddons was inspired by the antics of a real-life family who terrorised an entire county, but the gang here are beyond shambolic. When a news report describes them as 'highly professional' it seems like a joke. Moreover, given his recklessness, it's astonishing that Chad has never been charged and his rivalry with Rory Kinnear's incompetent copper is not exactly a meeting of minds. Siddons has cited the influence of cult Serbian comedy Black Cat, White Cat, though Trespass Against Us is sorely lacking in that film's visual panache and madcap humour; in fact, the relative anonymity of this effort is surprising given its director's background as an award-winning music video director known for his provocative style. Accents waver and, the occasional surging car chase apart, there's an absence of audacity as well as authenticity, while the gear shifts often jar. It's a film that never seems to know what to make of its characters, eventually plumping for a quirky, feel-good climax that represents yet another departure from what came before. Screening on Tue 21 Feb as part of the Glasgow Film Festival 2017. General release from Fri 3 Mar. Chad (Fassbender) is a cocksure criminal from a tight-knit traveller family, trying to get from under the thumb of his ignorant and paranoid father Colby (Gleeson). Fassbender is as magnetic as ever but the gang, supposed to be fearsome, is beyond shambolic, and Kinnear’s incompetent copper isn’t exactly a worthy rival.